Green Grandma: You Put the Grand in Grandparent Hop! At each stop you will find awesome prizes perfect for any grandparent or care taker. Sunday, September 11th is National Grandparents Day! Be sure to call, hug and reach out to the grandparents in your lives. There are far too many lonely grandparents out there longing to hear from their grandchildren. Make them a priority on September 11th and call, visit, and, if you can, gift them with cards and presents to let them know how much they're loved. If they're too far away to visit and they don't receive phone calls for one reason or another, handwritten notes and pictures of and from the grandkids can be a real treasure. In the book, The Conversations We Never Had, by Jeffrey H. Konis, a grandson realizes, far too late, that he'd taken his grandmother for granted. The book is part memoir/part historical fiction and chronicles the author's time spent with his grandma "Ola" and includes an imagining of the stories she might have shared had he only taken the time to ask the questions. "My father remembers nothing about his real parents," Konis writes. "They were dead by the time he was nine. Olga, his mother's younger sister, not only survived the Holocaust, but was able to find my father at his hiding place -- a farm in Poland -- and later brought him to America to raise as her own. In all that time, he never asked her any questions about his parents. Year later, I moved in with Olga for a period of time, but I allowed history to repeat itself -- a classic mistake -- and failed to ask her the same questions my father avoided. Olga has been gone for more than twenty years, along with everything she could have told me. I am left with a sense of guilt and profound regret, wishing so badly that I could go back and have a second chance to get to know her better and learn more about my family from the only person in the world who knew them and remembered them." Wow. What poignant words. What gripping remorse. 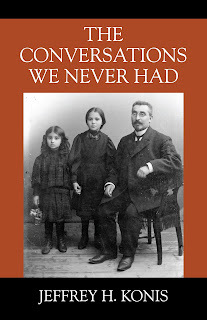 Jeffrey H. Konis has offered to provide one member of the GG community with a copy of his book, The Conversations We Never Had in this giveaway hop. After losing my own mother 3.5 years ago, I understand the pain he feels. If only I'd had the conversations with her. Now she's gone and the answers to many of my questions died with her. It is my hope, that through this book, others will avoid the same mistakes so many of us have made. Sit down with your grandparents, or parents, and listen to their stories. They are rich with history -- your history -- and there are only so many days/months/years left for you to listen. Don't regret the conversations you never had. 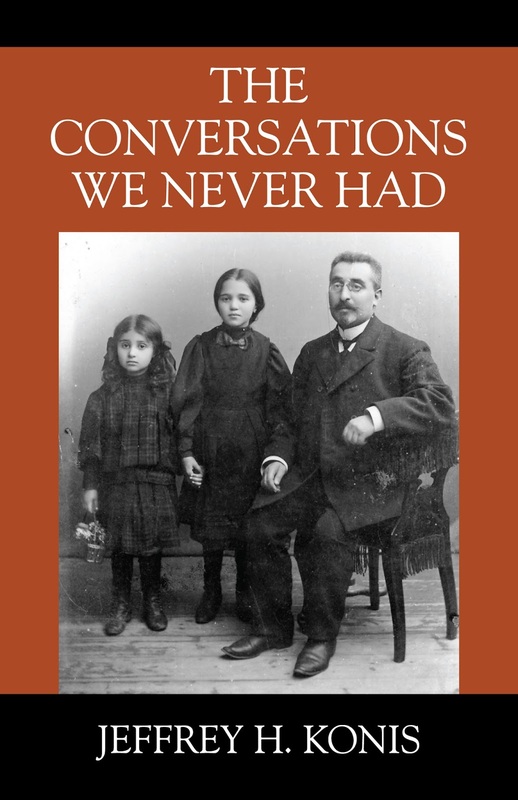 Enter below for a chance to win a copy of The Conversation We Never Had. And be sure to pass on your copy to your kids or grandkids! In addition to Jeffrey Konis's book, winner will also receive a copy of my book, Vinegar Fridays. 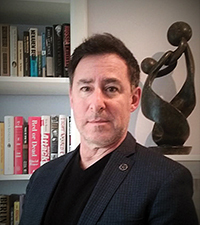 Jeffrey H. Konis left his profession as a lawyer to become a high school social studies teacher. His first book, From Courtroom to Classroom: Making a Case for Good Teaching, offers a unique perspective for teachers who seek to inspire their students to learn for the sake of learning. Like all authors, Jeffrey loves reading. He also enjoys collecting fine art photography, travel, soccer (especially Liverpool F.C. ), and, most of all, his family. He currently resides in Goshen, NY with his wife, Pamela, and sons, Alexander and Marc. You can connect with Jeffrey on Facebook, Twitter, and Goodreads. I would take to my grandma again just because I miss her so much! Maybe ask her what Heaven is like!! My grandfathers. They were both so intelligent and kind to me. I did not know my grandfathers. How fortunate you were to have both of them for long enough to remember their intelligence and kindness. I'd speak to my Great Grandmother and ask her how she coped with and accepted the loss of her children as I have now experienced losing a child as well. I'm sorry for your loss, Kaycee. I know how it feels to want to connect with a relative who walked a similar journey as you. It's so very hard. We just want answers, right? I'd say goodbye to my dad. I didn't get to have a goodbye conversation with him before he passed away. I'm so sorry, Dianna. I wish I could gift you with that final conversation. I'm with you on that one, Amy. I never knew 3 of mine either. And the remaining one spoke mostly Finnish, so we didn't have much of a relationship. My grandma so I can hear more of her stories! I miss them. Wouldn't that be wonderful? I'm so happy you had stories to miss in the first place, Amanda. What a blessing.